While Apples to Apples is an excellent game, it's also my clever blog name for all the Farmer's Markets here in Seattle. Josh and I have been enjoying all the flavors at the Farmers Markets. In fact, we've been going to the Queen Anne Farmer's Market Market each Thursday. We missed today's though because of the rain and not wanting to spend money. 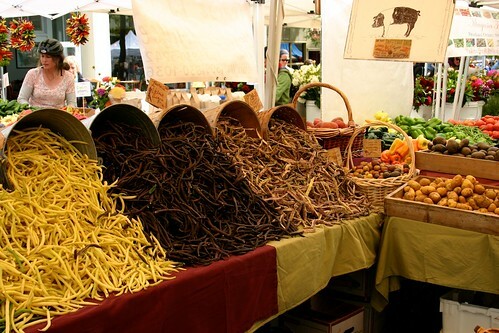 These Farmers Markets are all over the place. There is a market in each little part of town - Queen Anne, Fremont, Ballard, Wallingford, Capitol Hill, Magnolia, etc. And each of these fall on different days of the week. This means you can go to one practically every day of the week. By going to different markets you get to see other areas around town. There are some vendors that travel to each market, so you sometimes see the same vendors. However, there are definitely vendors specific to some markets. Generally there are similar items - apples, pears, peaches, veggies, bread, honey, pasta, jewelry, musicians, and more. Of course, they have all seasonal foods, so come fall and enter many will probably change. Sadly, most of the markers close down for the winter. Two do stay open - they are the biggest - and these are the Ballard and Fremont Farmer's Markets. These are the best ones though, so I'm happy. As for the others, it makes sense for them to close because, surprise surprise, it rains here. Today is a good example. It was pouring rain and Josh and I decided to stay in (well, we did go to the Wallingford one yesterday, but that doesn't help my point here). Grateful Bread - Pumpkin Muffins!! Lastly, I've shared some photos on my Flickr site of our Farmers Market experiences. Enjoy!